Gemini labs refuses to hand back "Prabhakaran"
LTTE illegal phone card racket was busted in the southern Palermo area in on April 15th, amidst the Sinhala and Tamil New Year festivities. Italian authorities swooped on and took into possession five telephone cards operated by the LTTE. The cards were impounded pending further investigations. Money laundering which is a very serious crime in Italy was linked to the Cards with the LTTE operating them. The LTTE was so sure of the operations they had picture of a Tiger on the card. 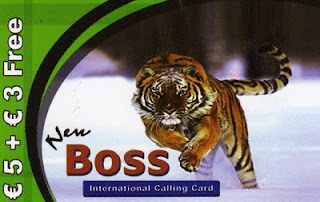 These cards with other cards with dubious Tiger connections were banned by the Italian authorities. Their names are: BOSS, SMS, EUREKA and EUROPA. Sri Lankan embassy has been actively helping the authoitries to combat the LTTE activities. Ambassador Hemantha Warnakulasuriya, earlier had helped in the stopping the transmission of LTTE channel in Milan. It has been noted that unscrupulous LTTE agents in Sri Lanka obtained call-terminating facilities from Sri Lanka Telecom. After the call-terminating license was granted, it was bought by the LTTE, which operated the telephone cards throughout Europe. It is learnt that the Sri Lanka Embassy in Rome has been keeping all the relevant authorities informed of such activities. It is estimated that there are more than 25,000 Tamils in Italy mainly concentrated in Palermo. The Cards are sold at 5 Euros per card and a person is expected to use at an average of about three cards for a month that is about an average of sale proceeds of Euro 375,000 per month. The Minister of Interior and the Anti Terrorist Unit in Italy, together with the Carabinieri and the Questura, are definitely squeezing and strangling the LTTE. The LTTE is gasping for breadth.. These agencies have been inundated with complaints about the activities of the LTTE agents especially in cities like Palermo by the Tamil daispora who had appealed to the Sri Lankan Embassy to protect them from forced extortion of money. The Embassy has with vigor accelerated the initiative to stop these innocent Tamils from contributing money to the LTTE. Palermo is in the southern part of Italy and has a population of about 8,000 Sri Lankans, the majority of which are Tamils. The Tamils who come from the north-east settled in the coasts of Sicily, most of those who have come illegally are now legal residents. Recently, during the Sri Lankan and Tamil New Year, The Tamil Association in Palermo conducted a festival which was organized by the Tamil Rehabilitation Organization, on information received by the authorities. The money collected in this exhibition was discovered by the police, which have taken the names of those who organized the festival. There is also racket transporting money to Sri Lanka through the ‘Hawala Scheme’, where the money collected is transmitted to Singapore for the LTTE to buy arms, and the money distributed to the recipients from taxes collected by the LTTE. Sri Lanka’s Ambassador in Italy Hemantha Warnakulasuriya when contacted told Asian Tribune that after his arrival, the embassy has taken steps to urge the Sri Lankans in Italy to make use of the banks to remit their moneys to Sri Lanka. He said now remittance from Italy touches safely Rs 1 billion. The Bandaragama Police recovered explosives, detonators, iron nails and 2kg of ammonium nitrate (NH4NO3), following precise information given by a civilian to the Police Emergency Information Unit (119) yesterday (April 28) morning at 7.10. According to Police sources, the recovery was made when search operations were conducted in general area Veedagama in Bandaragama. A bag was found left in a by road near the 'Veda Temple' at Veedagama and following items were recovered, Bandaragama Police said. Troops continued advances in the Wanni battle theater as troops claimed at least 10 LTTE killed and an enemy bunker line destroyed during confrontation erupted between troop and LTTE on Tuesday (April 29). In the Mannar front, in general area Kalliankadu troops launched intensive small arms and RCL fire destroying an LTTE bunker defence at 10.40a.m., security sources said. According to ground troops 3-4 LTTE terrorists were believed either killed or injured during the attack. Earlier, an LTTE terrorist was reported killed in a SLA sniper attack in general area Parappakandal, at around 6.45a.m. Also during a search operation conducted in general area Veppankulama troops have recovered 18 AP mines, security sources further said. Dr. Mahmoud Ahmadinejad, the President of the Islamic Republic of Iran and Mahainda Rajapaksa President of the Republic of Sri Lanka agreed to broaden and deepen their bilateral cooperation, in a spirit of mutual goodwill and friendship. They also agreed to continue regular high-level exchanges between the two countries follwoing their historic meeting yesterday in Sri Lanka. The two Presidents also discussed important regional and international issues and stated that unilateralism would undermine internationally accepted norms. Both sides condemned terrorism in all its forms and manifestations and emphasized the need for enhanced international cooperation to eliminate this global menace. The Iranian side expressed its support for the sovereignty, unity and territorial integrity of Sri Lanka and welcomed the positive political steps taken to end the conflict through negotiations, leading to a durable settlement, acceptable to all the people of Sri Lanka. Dr. Mahmoud Ahmadinejad, the President of the Islamic Republic of Iran, accompanied by a high ranking delegation paid a State Visit to Sri Lanka from 28 to 29 April, 2008 at the invitation of Mahinda Rajapaksa, the President of the Democratic Socialist Republic of Sri Lanka. Dr. Mahmoud Ahmadinejad was officially welcomed by the Sri Lankan President Mahinda Rajapaksa at a formal ceremony held at the Bandaranaike International Airport. Dr. Mahmoud Ahmadinejad held wide-ranging discussions with President Rajapaksa, attended by Ministers and senior officials of both sides. The discussions which took place in a cordial atmosphere, were detailed and substantive, covering issues of bilateral, regional and global interest. Both Presidents, while noting with satisfaction the progress achieved in bilateral relations, stressed their firm commitment to further enhance mutual cooperation in the political, economic, trade, cultural, educational, scientific and technological fields. The discussions reaffirmed the close and friendly ties that exist between Sri Lanka and Iran. Sri Lanka Air Force fighter jets attacked a building complex located adjacent to the air stripe maintained by the LTTE terrorists in Irnamdadhu jungle this morning. According to, the Air Force spokesman Wing Commander Andrew Wijesuriya, the air strike was launched around 9.45 am. Air force sources confirmed that the buildings were inflicted with severe damages. However, casualties to the terrorists is yet be ascertained, he added. It is heartening that a programme is now underway to demilitarize the Madu Church at long last. The liberation of that holy shrine from the clutches of a bunch of criminals who had turned it into an unholy fortress has brought relief not only to the Catholic community in this country but also to all Sri Lankans who treasure it as a national asset. Those who claimed that the Madu shrine was free from the LTTE presence stand exposed for their diabolical lies. Well fortified bunkers, trenches and other tell-tale marks demonstrate that the Tigers had launched offensives against the army from the Madhu precincts in a bid to have the shrine destroyed in retaliatory fire. Stepping into a place of worship is an enlightening experience. The army may have realised from its successful operation that took Madhu back safely that it could defeat terrorism in a similar manner. The Madhu battle also demonstrated the daunting task that a professional army is faced with in confronting a band of terrorists who enjoy unbridled freedom to achieve their objective even at the expense of a much venerated shrine. Sadly, even some priests betrayed their bias for the LTTE. A section of the media is clutching at the proverbial straw claiming that the army has taken back a hollow shrine without a hallowed statue. A similar argument was peddled when Jaffna was recaptured in 1995. It was claimed that the army had taken a ghost town and its victory was not worth its trouble. But, after sometime the forcibly evicted people returned - that forcible eviction didn't trigger an angry reaction from human rights activists in Colombo! - and Jaffna came alive. Likewise, the statue of Our Lady is bound to return to its venerated abode, sooner or later. The Tigers have proved once again that they are no respecters of religions. They have perpetrated heinous acts of terror against places of worship and the clergy, as we pointed out on Feb. 14 in the aftermath of its shell attack on the Thallady camp. They mowed down scores of Buddhist devotees in Anuradhapura in 1985 and gunned down 33 young Buddhist monks at Arantalawa in 1987. In 1998, they bombed the Sri Dalada Maligawa, the most venerated Buddhist shrine in this country. Among the crimes the LTTE has committed against Muslims includes the massacres inside two mosques at Eravur and Kaththankudy in 1990. Hundreds of Muslims were shot and hacked to death while they were praying. Last year, the Tigers killed a kurukkal in the Eastern Province as he had blessed President Mahinda Rajapaksa during his visit to the East. This year began with a crime the LTTE committed inside a kovil in Colombo, where UNP MP T. Maheswaran was shot dead in cold blood. Therefore, those who support, in any way, an outfit which doesn't hesitate to sacrifice anything human or divine on the altar of terrorism are making a disservice not only to this country and her people abhorring terrorism but also mankind. The LTTE is driven by the same fanatical terror as the al queda-Taliban combine that brought down the world famous Bamiyan Buddha statues in Afghanistan. None will be safe from the LTTE being encircled in the Wanni. Prabhakaran's desperation knows no bounds. Those whom God wishes to destroy, they say, he first makes mad. He doesn't need anyone else to destroy him. He is his own enemy! Now that the Madhu shrine has been secured, the onus is on the government to ensure its safety and preserve its sanctity. It must strictly be a demilitarized zone. Render unto God what's God's! A 7 kg time bomb has been found from Galgamuwa bus stand this morning. LTTE aircrafts dropped three bombs at the Welioya Forward Defence Line in the North early this morning but the military says it did not cause any major damages. Further, he added that “there are thousands of children who have being neglected by the governments in the past on education, growth and well being in the eastern province hence requested to those who carry those list to see the possibilities to provide better future through education and vocational training.” He urges the international and national groups who are talking and working on children’s rights to come up with good proposals, where he promised to gather thousands of marginalized and underprivileged children to benefit form. “I my self a victim hence will not get back to any such acts but will do my utmost best to serve for the children”, he said with a great passion and conviction. On the question of young adults age between 18-30 who have lost their lives as child soldiers by serving the LTTE, he again requested the UNICEFF and other organization together with the government to come up with plans to provide them basic vocational and educational training to become better citizens thus prohibit them joining any groups in the future or being re recruited as sleeping carders to the LTTE. He raised the concerns of those children who went away with their parents as they were poor and also were stigmatized. Responding to the question of further releases he assured, “these are the only underage that we have and as I said before I am concern of the thousands of children out there without any means of better life”. “We are in the democratic process which as President Rajapaksha said is much more difficult than what we were; we have to listen to all the allegations, criticisms, but no one is there to appreciate what we do”. He further said that ‘these people are not satisfied with our answers they want us to tell them that they are right in their figures and numbers” I would like to invite UNICEFF and other officials to come with the lists that they have so that we can walk to those houses and look for these children as some of these children, we were told has already back with their parents. At least 18 LTTE were killed and similar numbers wounded as SLA infantry and armour battalions ripped through south most LTTE defences during multi-pronged assaults launched from Mannar, Vavuniya and Welioya yesterday (April 25). According to the Wanni ground sources, troops made further strides into the non-liberated Wanni area after securing the sacred Madhu shrine from LTTE, in 2 fronts from Palampiddy and Thatchchanamarathamadu. In the Mannar theatre of battle, 3 LTTE were reported killed during confrontation with SLA at general area Palampiddy, while 3 more were killed separately in general area Thatchchanamarathamadu. A soldier also received injuries in the confrontation with LTTE, security sources said. According to media reports, United National Party (UNP) parliamentarian Dr. Jayalath Jayewardena has requested the assistance of the Royal Norwegian Government to establish a Buddhist temple in Oslo, Norway, for the benefit of Sri Lankan Buddhists living in Norway. In addition to the above proposal of Dr Jayawardanena, let us rush through some of his involvements for the ‘upliftment’ of Buddha Sasana, both in Sri Lanka and India, during the last few years. Police say they have taken in eight people for questioning over the bombing of the passenger bus in Piliyandala last evening. The casualty toll was expected to rise further. Twenty four (24) passengers were killed and 40 others injured in the Piliyandala blast, the Police said. The injured are being treated at Piliyandala, Kalubowila and Colombo National hospitals. A bomb exploded inside a CTB bus at the Piliyandala bus stand a short while ago, the Police said. Speaking from Colombo, the head of the UN children’s agency in Sri Lanka, Philippe Duamelle, highlighted the important role played by the government in securing the second major release of children by the TMVP in just two weeks. The Tamil Tigers' test transmissions of its Euro television channel from Israel using the RR Sat of Tel Aviv for uplink facility has been stopped after two days of test transmission. The Asian Tribune reported about this transmission earlier this week in the story titled 'LTTE's Euro Tv moves to Israel after blockade by France and Italy'.Koby Zontag, Director of Sales and Business Development, RRSat - Global Communications Network Ltd.(NASDAQ RRST), said that the Euro TV channel was brought to them by a 3rd party without disclosing its nature nor the organization behind it. "We have broadcasted a slide with the channel name for less than 24 hours. As soon as we understood the nature of the channel we immediately took it off the satellite," he said. "As your article damages our reputation we would appreciate if you will also publicize our above comment so it will be cleared that we have been mislead," he added. Shlomi Izkovitz, Deputy VP Sales & Marketing, RRSat - Global Communications Network Ltd. (NASDAQ RRST) wrote to the Asian Tribune today that the company did not transmit the Euro Television channel.However, the international satellite information website www.mediaworldasia.dk has listed Euro Television among the Tamil channels on April 14, 2008 and stated that it was uplinked on 9 degree East as a test transmission. Political analysts say that the European Union, the United States other countries that had proscribed the LTTE as a terrorist organization would welcome the RRSat decision to stop the test transmission of the Euro Tv. Sri Lanka army has liberated the sacred Madhu shrine by beating off the occupying LTTE terrorists today morning (April 25). The soldiers of 8 Sri Lanka Light Infantry reached the shrine as the terrorists beat a retreat unable to withstand the army advance. The centuries old Catholic shrine is held sacred and respected by all Sri Lankans irrespective of religion and ethnicity. Thousands of pilgrims used to visit the shrine, especially during the church feast in August, before the terrorists took control of the area in 1999. 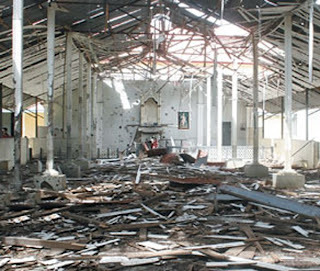 As LTTE terrorists unleashed their "Final War" in 2006, the church became a sanctuary for thousands of civilians who wanted to avoid their children being conscripted by the terror outfit. Later, LTTE agents acting under religious fa‡ades, evicted these civilians and unashamedly made many of them to fall prey to the terrorists. Gradually, the terrorists almost turned the shrine into a terror base by positioning its heavy guns around the church and using it as a barrack for its cadres. Though this desecration has been carried out for last few months the fact was kept secret from the general public until the sacred statue of Our Lady of Madhu was shifted two weeks ago. Meanwhile, Army 57 division battling against the terrorists on the Vavuniya battle front, tactically removed most of the terrorists' lines of communication to what had then become the terror stronghold inside the Madhu complex, making the occupying terrorists isolated from the rest. Army specifically resorted to this slow and painstaking tactical measure in order to avoid any military operations within the Madhu "No War Zone". Many soldiers had to sacrifice their lives and limbs in this endeavour as they refrained from any retaliation to shells launched from the vicinity of the church complex. The mode of operandi became a success as the terrorists started to withdraw amid the increasing military pressures outside the no war zone. The LTTE bands, "Malathi", "Radha" and "Charles Anthony" withdrew from the area after shifting their heavy guns. A small LTTE element lead by a terrorist leader "Gopith" was the last known terror group to remain at the church. At present, army troops are clearing the surroundings of the church, as there is a strong possibility that the terrorists have booby-trapped the church building before they leave. Army spokesman Brigadier Udaya Nanayakkara says the air force has launched a massive attack on a black tiger training camp in Pannikkamkulam north around 6.20 this morning using Kafir and MIG air craft. The camp was located north west of Mankulam. Spokesman for national defence Minister Keheliya Rambukwella says more than one hundred LTTE carders were killed in clashes in areas surrounding the forward defence circle in Muhamalai. Another 200 LTTE members were injured. 43 members of the security forces have also succumbed to their injuries. The Minister at a media briefing in Colombo this morning also said 22 injured soldiers have returned to the battle front. He added that the troops were able to capture the first defence circle of the LTTE in this operation. Liberal Democrats MP's have been working closely with agents of the Liberation Tigers of Tamil Eelam (LTTE) for a considerable time which resulted in the formation of the "All Part Parliamentary Group for Tamil Tigers APPG(T) chaired by Leicester East MP Keith Vaz, who has consistently been scrutinized in the British media over his clandestine links with the LTTE otherwise known as the British Tamil Forum (BTF) in the UK. Keith Vaz MP is also chairperson of the UK's "Home Affairs Select Committee" and is described to be "above the law". It is said that he is yet to be questioned and prosecuted by the UK's Metropolitan Police over his involvement with the British Tamil Forum (BTF) and the "LTTE's Heroes Day" celebration at the London Docklands Excel conference centre. The law enforcement authorities British authorities failed to question participating MP's on how the British Tamil Forum (BTF) raised such large sums of money in order to pay for the venue hire. These days it’s all about securing votes, and these politicians are more than happy to liaise with terrorists or agents of terrorists and secure their votes in parliament and local assembly elections. The London Tamil Councilors Association (LTCA), chaired by London's Harrow Councilor Thaya Idaikadar too comprises of agents of the British Tamil Forum (BTF) of which Labour party Councilor Thaya Idaikadar is a key figure. The Chief Whips of the Labour, Conservative and the Liberal Democrats have failed to take into account the seriousness of their Parliamentarians colluding with terrorists and their agents in the UK. With the London's GLA (Greater London Assembley) Mayor elections scheduled May 1st, it is said that over 60,000 Sri Lankan’s from all communities who are opposed to the LTTE will boycott the Labour party candidate Ken Livingstone in favor of an alternative London Mayor. Over 100 LTTE including 15 senior terrorists and 43 soldiers were killed in fierce fighting that lasted for 11hours between SLA and LTTE in the narrow and open land stretches at Muhamalai and Kilaly - Jaffna yesterday (Apr 23), according to finalized reports received from North. Troops have also recovered 9 LTTE bodies left behind as Army pushed and gained control over the LTTE's first line of defence at Muhamalai. Many LTTE bodies are scattered in the area and preparations are made to recover the bodies and hand those over to the LTTE through the ICRC, military sources said. The LTTE fighting formations were driven some 500m back from its initial positions as troops mounted heavy resistance attacks, thwarting a pre-dawn LTTE offensive attempt. 55 and 53 divisions of Army entered into the battle from Muhamalai and Kilaly areas as pitched fighting broke out with soaring casualties from both sides. "Soldiers have been able to capture the first line of bunkers of the Tigers in Muhamalai. LTTE terrorists came and attacked our forward line on Wednesday morning, we have retaliated and captured about 400 to 500 metres of LTTE area in Muhamalai," said military spokesperson Brigadier Udaya Nanayakkara. 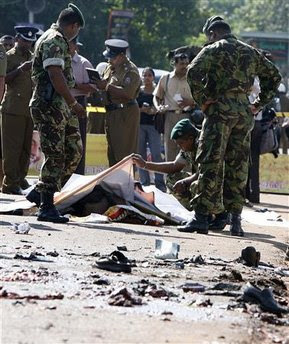 It has been reported that 120 soldiers had suffered injuries and those in serious conditions have been already air lifted to Colombo. According to reports, the injured were admitted to the National Hospital- Colombo, Sri Jayawardenapura and Eye Hospital. The Media Centre for National Security said that, 33 soldiers have gone missing following the confrontations and search operations been continued along the tensed battle lines at Muhamalai and Kilaly. "Canter vehicles loaded with dead LTTE cadres and casualties were rushing continuously towards Mullaittiuvu and Kilinochchi districts since yesterday morning as civilians were restricted of movement along the main routes for over 7 hours", unverified sources close to LTTE were quoted as saying. 15 senior LTTE cadres who have led the fighting units during the offensive were killed as the brunts of terrorist casualties were reported from North of A-9 at Muhamalai, according to the sources. LTTE civil militia units and 'Police' stormed into government hospitals at Kilinochchi and Mullaittiuvu; forcibly vacated the area of civilian presence allocating space for the arriving LTTE casualties. Accommodated patients were taken off from their beds and forced to lie on cardboard sheets, while women and children were cornered and others chased away from the sites, the sources were quoted further saying. Defence sources report that the LTTE offensive was overall led by Theepan and Muhundan, two senior LTTE cadres , whilst fighting formations at Muhamalai and Kilaly were reported respectively led by 'Jerry', Kumunan and Kutti. Jaffna theatre of battle heated up since early this morning (April 23), as Sri Lanka army 55 and 53 divisions put- on stiff resistance to an LTTE embarked fresh offensives at the Army forwards defences on the Muhamalai and Kilaly frontiers. According to the defence sources in Jaffna heavy fighting broke out between troops and LTTE since 2 am this morning, as troops mounted retaliatory attacks at the offensive LTTE formations. According to latest information LTTE suffered severe beating and were pushed some 500m back from its initial positions. Seizing the opportunity SLA broke the LTTE's first line of defence in the Muhamalai front, and are now engaged in consolidating the defence lines, security sources said. So far, 15 soldiers have laid their lives while 74 suffered injuries and some of them have been air lifted to Colombo national hospital. The Tamil Tigers started test transmissions of its Euro television channel from Israel using the RR Sat of Tel Aviv for uplink facility. This move came after its earlier attempts to revive the Euro TV from Italy and France failed due to timely action taken by Sri Lankan embassies in Rome and Paris respectively. Finalized military reports received from battlefronts in the North indicate 28 deaths of LTTE cadres during yesterday's (April 21) clashes with Army. In addition, according to the reports, one soldier was killed and 17 others suffered injuries during these clashes. In the Jaffna theatre of battle, troops launched several attacks at LTTE defences in the Muhamalai and Elthumaduwal areas during the day and claimed 4 LTTE bunkers were destroyed. 2 LTTE cadres were reportedly injured in these attacks. 4 soldiers suffered injuries due to LTTE mortar fire and anti personnel mine (AP) explosions. Peace Secretariat of the Liberation Tigers of Tamileelam reports that Rev. Fr. Karunaratnam, chairperson of the North East Secretariat for Human Rights, (NESHOR), an organization under the control of the Tamil Separatist outfit, Liberation Tigers of Tamil Eelam was killed by a claymore attack on the Mallavi – Vavunikkulam Road, at 12.30pm today. Mallavi is a town located 5 kilometers before Thunukkai, an area controlled by the LTTE. However Peace Secretariat of the Liberation Tigers of Tamileelam reported that Rev Fr Karunaratnam was killed by a claymore attack. SLA infantrymen backed with heavy mortar fire forced into LTTE defences this morning (April 20) in general area Chinnavalayankaddu, North of Vilathikulama, Vavuniya killing 3 terrorists and destroying an LTTE bunker, Wanni military sources said. Defence sources in the Mannar battlefront this morning said that 13 terrorists had been killed in yesterday's (Apr 19) clashes with troops. JVP provincial Councilors say they will support Wimal Weerawansa faction if the JVP does not solve internal conflicts . Sending a three page letter to the General Secretary of the party Tylwin Silva , he said Wimal Weerawansa’s problem is not his own crisis. It is a long term internal conflict of the party, said Team leader of the Ratnapura District JVP Provincial Councilors E.W.S.Priyanjith Silva. In his letter Mr. Silva noted the public have suspicion about JVP activities due to their past actions on burning issues. Creating a niche in Sri Lanka’s politics by presenting himself as a leader of a minority community and mixing his religion , Roman Catholicism with politics with ambitions to become the Prime Minister of Sri Lanka as a close confidante of the President is one of the main reasons former Highways Minister Jeyaraj Fernandopulle was assassinated says, a pro-LTTE weekly printed in Canada and distributed all over Europe. TheParaparappu, the pro-LTTE political and Tamil language weekly distributed widely among expatriate Tamil communities in Canada, Britain, Switzerland, Australia, France, Nederland, Norway, Demark and Germany says in its cover story that undoubtedly he was the closest man to the President and was keeping his eyes on the chair of the Prime Minister. President Mahinda Rajapaksa has assured his political arch-rival, Ranil Wickremesinghe that he will look into a request made by the United National Party (UNP) to make available a helicopter for Wickremesinghe’s election campaign in the Eastern Province. The assurance was given when Wickremesinghe met Rajapaksa at a weeding. Wickremesinghe had lamented the Defence Ministry’s refusal to provide him with a helicopter for a four-day election campaign, to be carried out in view of the May 10 Eastern Province Provincial Council Elections. Sri Lanka Air Force fighter jets bombed an LTTE boat formation comprised of three heavily armed fast boats located in the South of Mullaithvu lagoon this evening (April 19). According to the Air Force sources, the bombing mission was undertaken around 5.30 pm, on information provided by Navy units patrolling in the area. Police personnel in route clearing petrol in general area Thambalagamuwa have narrowly escaped from an LTTE claymore explosion took place this morning (19 Apr). The police personnel were returning after completing a duty in a vulnerable area where an electricity transformer located in Thambalabamuwa along Pokurani - Kinniya road, when the terrorists activated the claymore around 6.15 am, sources said. As it is reported from the Vavuniya front, 8 terrorists were killed while 2 others suffered injuries in confrontations took place several places in Vavuniya front today, April 18. According the latest reports reached from the Mannar front this evening, 9 LTTE cadres were killed in clashes occurred through out the day, April 18. Sri Lanka Air Force fighter jets attacked LTTE's key logistic complex and engineering yard in general area Visuvamadu, 15 km north west of Puthukkudiyiruppu in Mullaithivu district, this morning (Apr 17). According to the air force sources, the bombing mission was carried out between 6.25 am - 6.35 am. A 2.5 kg weighing time bomb was found and defused immediately by security forces personnel and Panwila Police during a combined search operation conducted at the Kelebokke area in Panwila - Kandy this evening (April 17). According to Panwila Police sources, the bomb laden with C-4 high explosives was found whilst set to explode a transformer inside a tea factory. "It was set to explode at mid-night today and probably this is a sabotage attempt by LTTE operatives", Police sources said. Sri Lanka Air Force MI 24 helicopter gun ships carried out air sorties targeting an LTTE bunker line and mortar gun position ahead of Muhamalai security forces forward defence line (FDL) this morning (April 16). Air force spokesperson Wing Commander Andrew Wijesooriya said that the air raid was launched around 6.15 a.m. to assist the ground troops engaged in counter terrorists offensives in the area. Meanwhile, Air Force fighter jets bombed three identified LTTE camps located in Oddusudan area late in the night yesterday, Air Force spokesman further said. An arms trade monitoring group has criticised the sale of 10,000 military missiles by Slovakia to Sri Lanka.The missiles are designed to be dispatched from multiple rocket launchers.There are concerns that the sale could constitute a violation of the spirit of the European Union (EU) Code of Conduct on Arms Exports. The three-metre missiles were due to be shipped to Colombo on Thursday, the BBC said in a news report.Sri Lanka has been engaged in civil war for 25 years, and Saferworld is concerned that the weapons could be used against civilians. Head of arms exports controls at Saferworld, Roy Isbister said that the EU code of conduct forbids arms exports where there is a danger the weapons could be used against civilians. Security forces have been successful in eliminating about 2,517 LTTE cadres within the last three months, Military Spokesman Brigadier Udaya Nanayakkara told The News-Lanka. It is estimated that, there were around 5,000 fighting cadres in the LTTE at the beginning of this year. According to Brigadier Nanayakkara, the security forces had killed 834 LTTE fighting cadres in January and another 874 cadres were killed during February, while 678 LTTE cadres were killed last month. Another 131 LTTE cadres were killed by troops by April 4. Brigadier Nanayakkara however claimed that although they had been successful in eliminating a large number of cadres, it did not mean that they had only a few more cadres to finish off, as there was a huge possibility that the LTTE may have commenced enlisting new recruits to its cadre base. The total strength of the three security forces, is around 200,000. In addition to this, there are around 70,000 Police personnel in the Police Department. The Army has around 150,000 personnel, while the Navy has a strength of 30,000 members, and the Air Force has a strength of about 20,000. The basic salary of a soldier is approximately Rs.14,000 plus a ration allowance of Rs.6,374 and cost of living allowance of Rs. 2,125. Air Force jets this afternoon raided an LTTE Communication Center south of Mankulam. The Air Force claimed it had destroyed the target completely. Fighting ensued between the Sri Lankan Army and the LTTE despite torrential rains in the Wanni battle theatre on Monday (April 14), where 5 LTTE were reported killed and 20 others wounded. LTTE terrorists have triggered off a claymore mine targeting a motor cycle carrying civil security force personnel in Kebethigollewa this morning, April 15. According to available information the explosion took place at 7.45 a.m while civil security forces personnel on their bike along the Thalgahawewa - Yakawewa road in general area Kebethigollewa. The victims who received injuries were rushed to the Kebethigollawa hospital for immediate medical attention. According to the reports received by this morning (April 13), intercepted radio transmissions have confirmed terrorists numbering 77 killed and at least 26 others injured on Mannar front alone. In addition, 12 soldiers died in the battle while 29 others suffered injuries, reports revealed. During these operations, 8 LTTE bunkers located at various positions on the battlefront came under army. During the search operations conducted so far 1 body of slain LTTE cadres have been found. According to the military reports, heavy clashes erupted in Vilattikkulam , Vinayagakankulam ,Chinnavalayankaddukulam and Madhu camp areas in the Vavuniya front during the daytime yesterday. Ground troops claimed 9 terrorists were killed and 2 others injured while 3 soldiers also suffered injuries during these clashes. Meanwhile, 3 soldiers suffered serious injuries due to anti personnel mine explosions occurred in the Chonakulama and Madhu areas on the same day. Snipers deployed in Madhu camp area gunned down 1 LTTE terrorist, reports further reveal. Adding more ingredients to the uncertainty within the JVP, one of its parliamentarian’s yesterday denied media reports that she was being held forcibly and insisted that she stayed at a friend’s house overnight and was unable to contact her driver which led to the confusion. Addressing a news conference in Colombo, JVP Parliamentarian Sujatha Alahakoon said she was duped by the dissidents to join them and there was no truth in media reports that she had disappeared.She claimed she was unaware about a split within the party following a statement made in Parliament by Wimal Weerawansa until she came to the Nippon Hotel media briefing on Tuesday. “We were all shocked at Mr. Weerawansa’s statement in Parliament on Tuesday. Nobody knew anything about the statement before it was made. In fact we later wanted to mend fences and I thought the MPs who accompanied me were going to announce that the matter had been amicably settled,” she said. The dissident group went to the headquarters of the Patriotic National Movement instead of the party office at Pelawatta. There, they were lectured by Senarathna De Silva, a former party stalwart and Politburo member who had been sacked later. At the news conference she wanted to reach a compromise, she said. Commenting on media reports about her alleged disappearance she said she could not contact her driver on Tuesday as she stayed over night at a friend’s house. She said she went to her residence at Matale the following day to take the flak of her husband and relatives who were worried about her safety. Anuradhapura district Parliamentarian Ranaweera Pathirana who left Tuesday’s media briefing under police protection after attempting to disrupt it said there was a conspiracy against the JVP. Asked about the attacks on a number of dissident MPs he said he did not know about any attack on any of them. Mr. Pathirana declined to condemn the attack on his fellow Parliamentarians and maintained that party loyalists who voted for the JVP would have been very angry about those who defected. JVP MP Jayantha Wijesekara has surrendered himself to the Police over the hijacking of the dissident JVP MPs’ vehicles.JVP MP Jayantha Wijesekara was remanded till April 17 in connection with the hijacking of dissident JVP MPs’ vehicles. Air Chief Marshal Harry Goonetileke ndc, psc who served as the fifth commander of the Sri Lanka Air Force from November 1976 to April 1981, passed away peacefully this morning at his home at the age of 79. Air Chief Marshal Harry Goonetileke ndc, psc who was predeceased by his son Group Captain Shirantha Goonetileke, who died in action in 1995, leaves behind his wife Marion Goonetileke, his son the present Air Force Commander Air Marshal Roshan Goonetileke, his daughters Shiromini Guruge and Sharmini Fernando, his daughters in law Nelun Goonetileke and Roshanthi Goonetileke, his sons in law Oliver Guruge and Kenneth Fernando and his Grandchildren Nihara, Rehan, Rukshila, Manillka, Mirasha, Evan and Ronali. The High Commissioner for Human Rights Louise Arbour has strongly condemned the suicide bombing which killed a Government minister and at least 14 other people at the start of a marathon in Sri Lanka, on April 6. She also extended her condolences to the bereaved families of the Victims, as the funerals of the victims continued to take place on Thursday, states the Office of the High Commissioner for Human Right's (OHCHR) in a press release. "Such violence shows a complete disregard for the right to life and security of Sri Lankans, and breaches the most fundamental principles of international law," Arbour said. JVP parliamentary group leader and Propaganda Secretary Wimal Weerawansa has gone into hiding following death threats to him and the ten JVP MPs who backed him after the party split early this week. Weerawansa had left his residence yesterday on the advise of his supporters and gone into hiding following his differences with the party leadership, political sources said. Meanwhile, the vehicles belonging to three JVP parliamentarians, who are backing Weerawansa, had been forcibly taken away by unidentified groups. A senior police officer said the vehicles of Piyasiri Wijenayake and Achala Jagoda had been robbed on Wednesday from the Parliament garage and the vehicle of Samansiri Herath was taken away by a group of persons who had gone to his home at Arachchikattuwa, Chilaw the same night. The group which had robbed the vehicles from the parliament members’ garage had also attacked a policeman there. He was admitted to hospital. The Chilaw police said Samansiri Herath had made a complaint that a group of persons had come to see him on Wednesday at his home at Arachchikattuwa. They were engaged in a cordial conversation but suddenly started arguing with him. They had then assaulted his driver and taken his vehicle. There was yet another report that a fourth vehicle, the one belonging to Matale District JVP member Sujatha Alahakone was robbed. But it was found that the vehicle was taken from her residence to another place by her driver. Police said all the three vehicles had been robbed by JVP members. Parliament Police and Chilaw Police have commenced investigations. The United States welcomes the release on April 7 of eleven children by the Tamil Makkal Viduthalai Pulikal (TMVP). We commend the efforts of the Government of Sri Lanka, UNICEF, and other parties to bring about this release and their commitment to providing counseling, rehabilitation, and training that will enable former child soldiers to become productive members of society. As the Government of Sri Lanka and the people of the Eastern Province work to bring stability to the East by expanding economic opportunities, strengthening the rule of law, and ending violence, this initial release of children is a positive development. It is a welcome first step, but there is more to be done. The United States urges the TMVP and other armed groups in the country to release all children under their control so that these young victims of conflict can begin the process of psychological healing, social integration, and education that will lead them to a brighter future. The Ministry of Human Rights and Disaster Management in a release said yesterday, that the Government had accepted 11 child soldiers released by the TMVP, and had directed the relevant authorities to commence a programme of rehabilitation for the children with immediate effect. A soldiers suffered serious injuries when two members of LTTE pistol gang opened fire at an Army patrol at Nallur, in Jaffna this morning (April 10). Sri Lanka army at two separate occasions attacked LTTE boats detected in Jaffna lagoon last morning (April 9).According to the defence sources in Jaffna, seven LTTE boats in two groups were detected in the Jaffna lagoon , off Ariyalai , moving towards security forces forward defence line (FDL) around 10.20 am. The house and other property of three JVP dissident’s came under attack late last night and early this morning injuring at least one parliamentarian. Sri Lankan government today announced that 93 soldiers were killed and 676 were injured during last month's fighting against Tamil Tiger rebels in the Northern province. Prime Minister Rathnasiri Wickramanayaka speaking at the Emergency debate in the parliament said that 38 civilians had also been killed in the clashes.The parliament today extended the state of emergency for another month. Six LTTE terrorists were killed in clashes occurred in Mannar, Welioya and Vavuniya fronts today, April 09, as it is reported from the forefront short while ago.In Mannar front, army snipers deployed in general area Adampan and north of Parappakandal gunned down two LTTE cadres this afternoon, sources said.Ground troops have observed that terrorists fled the area with three of their cadres received severe injuries. In Welioya front, two more LTTE cadres were killed by the troops in a confrontation took place in north of Kiriibbanwewa. Another two cadres also received injuries. Two soldiers also suffered injuries.Meanwhile, in a separate confrontation took place in north of Janakapura, an LTTE terrorist was killed while 3 others were injured. Sri Lankan President Mahinda Rajapakse arrived in Sanya, a scenic city in south China's island province of Hainan, Wednesday for the annual meeting of the Boao Forum for Asia (BFA). He is the first foreign state leader arriving here for this international meeting, due to open on Saturday in Boao of Hainan Province. During Rajapakse's stay in Sanya, Chinese President Hu Jintao will meet with him, and the two leaders will review the development of China-Sri Lanka relations and exchange views on facilitating bilateral win-win cooperation. According to sources with the Chinese Foreign Ministry, Hu will deliver a key-note speech at the opening ceremony of BFA. Army snipers deployed in general area Madhu camp has gunned down an LTTE terrorist this morning, April 09. According to the sources the incident took place at 10.55 a.m. today. Chief of Defence Staff Air Marshal Donald Perera, Army Commander Lieutenant General Sarath Fonseka, Navy Commander Vice Admiral Wasantha Karannagoda, Air Force Commander Air Vice Marshal Roshan Gunatilleke and Inspector General of Police Victor Pererapaid their last respect to the slain minister Jeyaraj Fernandopulle at the minister's private residence in Katana this morning, April 09. Parliament today (09) extended the 'State of Emergency' by majority of 78 votes. A total of 93 voted in favour of the extension while 15 voted against it. The motion to extend the emergency was tabled by Prime Minister Ratnasiri Wickramanayake. While the JVP voted with the government, the UNP abstained. Members of the SLMC were not present in Parliament at the time the vote was taken. Canadian Parliamentarian Art Hanger yesterday (April 8) presented a civic petition against LTTE terrorist activities on the Canadian soil before the House of Commons. The MP who represents Calgary Northeast, speaking on the petition said that it is on the subject of eradicating terrorism with special reference to the Sri Lankan based terrorist organization Liberation Tigers of Tamil Eelam (LTTE). "I am honoured to present a petition submitted to this House by 1,068 Canadian residents throughout the length and breadth of this country on the subject of eradicating the scourge of international terrorism, with special reference to Sri Lanka" MP Hanger said. The Kelaniya Flyover constructed on the initiative of the late Minister of Highways and Road Development Jeyaraj Fernandopulle in record 61 days at a cost of Rs. 2.2 billion, will be named “Jeyaraj Fernandopulle Memorial Flyover,” tomorrow as a mark of respect to him. Defence sources in the Mannar battlefront reveal that 9 terrorists have been killed so far in yesterday (April 8) clashes. According to the militery sources, army infantrymen have launched an attack at LTTE bunker defence located in the Thiruketheeshwaram area around 3.30 pm (yesterday). The ground troops have revealed that at least 4 LTTE cadres were killed in this incident. Army has suffered no casualties, the sources add. 10 JVP MPs who support MP Weerawansa say at press conference they want to resolve current problems in party while staying in party.JVP MP Piyasiri Wijenayake today said that 10 JVP MPs are to follow Wimal Weerawansa and act independently in parliament. 6 Tamil civilians including 4 females sought protecting with security forces after fleeing from the non-liberated Wanni area on Sunday (April 6). The people have arrived at Pudukudiiruppu, a coastal suburb in Mannar under security forces control and were later directed to an IDP center in general area Pariharakandal under the safe custody of the Mannar Police. Sri Lanka, Air Force supersonic fighter jets bombed at LTTE black tiger base located at Northwest of Mankulam this morning, (7 April). Air force spokes person wing commander Andi Wijesoriya speaking to defence.lk said that their sorties were launched around 6.15 a.m. based on the information gathered through air surveillances and ground intelligence sources. The pilots confirm that the target was achieved accurately, he added. The Wanni liberation operation is continuing further inflecting damages to the enemy in Northern and Wanni battle fronts, defence sources in Mannar said. According to the report reached from forefront 22 terrorists were killed while another 22 cadres were wounded due to the clashed sparked yesterday, April 05. On Jaffna theatre of battle, an LTTE terrorist was gunned down by the army snipers deployed in Nagarkovil front yesterday.On Wanni theatre of battle, in Vavuniya front incidents were reported from Palampiddi, Madhu and Vilattikulam areas. Troops ambushed an LTTE movement in general area Palampiddi around 11.10 a,m yesterday. Intercepted LTTE radio communication, it is revealed that 4 LTTE cadres were killed in this attack. An army soldier also suffered minor injuries due to this incident. Three more LTTE terrorists were killed in a separate confrontation took place in general area Madhu, the report said.In general area Vilattikulam, three terrorists were killed while another three were injured when the troops launched an attack targeting LTTE bunker defences around 12.20 p.m yesterday. Meanwhile, 52 hand grenades were found by the troops on search operation in general area Madhu.In Mannar front, army snipers deployed in Thirukethiswaram gunned down 2 LTTE cadres in two separate shooting incidents last afternoon. Meanwhile, two army personnel made their fullest sacrifice for the sake of motherland due to anti-personnel mine explosions while conducting clearing operation in recently liberated areas in Thirukethiswaram and Adampan. SLAF fighter jets bombed an LTTE training base located in general area Pulopalai, South East of security forces FDL - Muhamalai this morning (04 April). Air Force spokesperson Wing Commander Andrew Wijesooriya speaking to defence.lk said that the air raid was conducted between 6.20 a.m and 6.40 am today with fighter jets. Air raid was launched observing latest development at the targeted LTTE base through the air surveillance conducted recently, he added. The pilots confirmed that targeted LTTE training facility was completely destroyed due to the bombardment. Defence sources in the Wanni battlefront citing intelligence reports say that LTTE terrorists have ordered the priests in the Madhu church to leave church premises with immediate affect. According to the sources, LTTE terrorists have issued their orders today (April 3) with the full backing of an influential terrorist supporter in Mannar, in order to spare the church premises for terrorist activities. Earlier, LTTE had positioned its heavy mortar and artillery guns at close range to the church in order to take cover from the civilian refugees at the church, said the sources. However, as the priests and the refugees started to protest against the cowardly tactics of LTTE, the terrorists have ordered the priests to leave the church premises, the sources added. 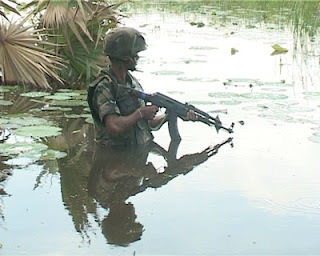 Troops have moved further towards LTTE territory despite inclement weather condition in Jaffna and Wanni areas inflecting heavy damages to the enemy yesterday, April 02. On Jaffna theatre of battle, two LTTE terrorists were killed and one suffered injuries due to the confrontations took place in Muhamalai front. Two cadres were either killed or wounded due to the clashes. One soldier sacrificed his life for the sake of motherland while six others received injuries due to the clashes occurred in Muhamalai front. On Wanni theatre of battle, in Vavuniya front, troops deployed in general area Sinnapandivirichchan have foiled an LTTE attempt to recapture their territory which had already been fallen to security forces hands yesterday, April 02. 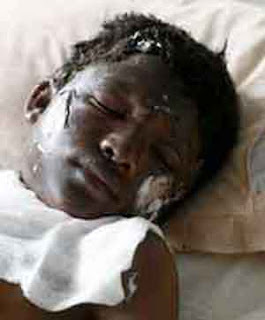 By intercepting LTTE transmission, it is revealed that eleven cadres had been killed and five more suffered injuries in this attack. In subsequent search operation conducted in the area, a body of slain LTTE cadre was found by the troops. Two army personnel have made their supreme sacrifice while fifteen others received injuries during this battle, the reports reached from forefront said. The Chennai's Gemini Colour Laboratory refused to hand back the Sinhalese and Tamil language negatives robbed from the Director of the controversial film entitled Prabhakaran. Pro-Liberation Tigers of Tamil Eelam political activists robbed the negatives of the full length feature film named after the LTTE leader Prabhakaran when the Director of the film Thushara Peiris was there at the Colour laboratories attending to the processing of the film. The newspaper quoted him having said the laboratory administrators asked for a letter from the Federal government in New Delhi to handover the negatives of the film to its rightful owners when the director of the film travelled back to the colour laboratories to receive the negatives he owned. The laboratory owners in a seemingly frustrating act told the owners that the film negatives robbed from the director could only be released with the permission of the central government. SLAF fighter jets made precision sorties at a discreet LTTE gathering point this morning (April 2) located West of Visuamadu Kulam in Mullaittiuvu district. According to Air Force Spokesperson Wing Commander Andrew Wijesooriya, the location was frequented by senior LTTE cadres. The target was accurately engaged and damages caused to LTTE were no known at the moment, he further said.